Matt: Hey folks, this is Matthew Weiss here, and I’m here with my friend. Samik: Oh, The Symphony. Hi guys. Matt: Yup. And we’re here for theproaudiofiles.com. You can check out theproaudiofiles.com/workshops. Because I don’t know the difference between a forward slash and a back slash. So theproaudiofiles.com/workshops for some really cool tutorials about an hour length that go specifically in depth into one single topic. Now, this is going to be a little cross interview thing here about the role of the producer versus the role of the mixer in terms of how we approach mixing. So, okay, so Samik and I have been working together for a very, very long time, and we’ve — to say the least. I think 2004? Right? Matt: About 2004. Alright, so that’s like, 13 years. So we’ve established a very good back and forth working relationship, like I know what he’s going to do, he knows what I’m going to do. In terms of mixing, when you send a record off to me, what is your expectation for what I’m going to do in terms of like, how you set the rough mix? Like, what — do you expect me to stick with it, do you expect me to deviate from it, where can I deviate, where can I stick with it? That kind of stuff. Samik: Okay, you want the answers to all of those simultaneously. Matt: All at the same time. Samik: I’m going to keep speaking into the mic like this. But no, when I send you a record, I know that I want the record to have more depth than what I have, because I feel like I can get to a certain point with my mix, and it sounds decent, but I need all of those little transients and things to, you know, be there. Samik: I don’t know. We just say it a lot. Samik: Yeah, it’s just the details of the sound. I like to think of it that way. The details of the sound. Matt: Okay, so let’s say I get a record from you, and I hear a drum. Matt: Like, let’s say it’s a snare drum, and I think to myself, this snare drum would sound really cool if there was like, a deeper snare tucked underneath a bit. Matt: When is that an appropriate decision for me to make and when is it not? Samik: I would say that for the most part, when I send records, I like to — my drums are the way I like them, but if you feel there needs to be more punch in the mid-range, I guess, I would be interested to hear how it sounds. I wouldn’t shoot down the idea right away, I would actually just be like, “Alright, well if you feel that, then let’s see what it sounds like,” and I think we’ve done that plenty of times. But yeah, for the most part, I think that if there’s a — if whatever makes the record sounds better, I’m with it. So I’ve got no problem with it. So if the snare doesn’t feel like it has a lot of mid-range in it, like lower mid or something like that, my first thought is, it’s probably meant to be like that. Once I start putting the record together, then it might change, and I might say, like, “You know, I think this is a specific case where maybe layering another snare in, or doing some kind of EQ that does significantly alter the tone of the snare,” it would be appropriate. But that’s like, that’s a second or third decision. Samik: Right, yeah, mainly when I send you something, it’s pretty much the way I want it. I just need you to make it sound better. Samik: Very not experience. Little to no track record with anything. Matt: Like Ill Mind, yes. [laughs] So I have to make a judgement call, like maybe this is someone who had a fantastic idea, but just doesn’t have quite the chops, and there’s nothing wrong with that, because actually, a lot of the times, I think the newer producers have the freshest ideas, it’s just really, they’re coming to me for the experience that you don’t get for nine or ten years. In that case, I might take a few more liberties. I might reach a little bit further. 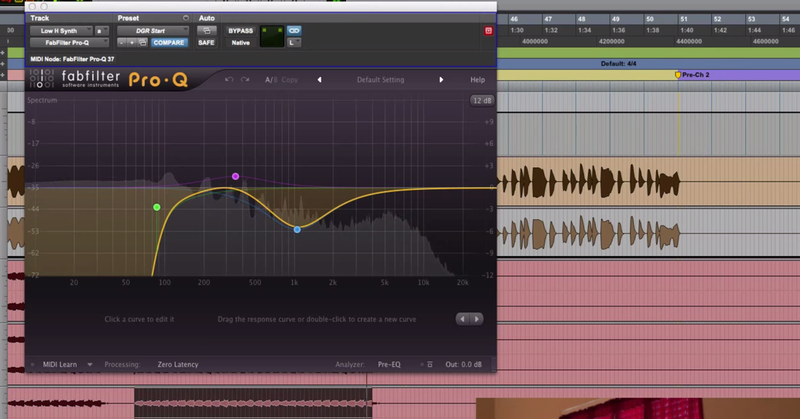 So when you’re producing, what do you consider the difference between mixing and sound design? Samik: Okay, um… It’s hard for me to say specific, because we do — we do a lot of both when we’re working on my stuff, but for sound design, I would preferably — you know, I would do all of that stuff before hand. So that would be the stuff that I take care of in the actual — you know, so the synthesizers, if I want the synthesizers to sound more gritty, I’ll make it so it has some distortion on it, but these are all things that I know. Like, I mean I’ve learned a lot of this stuff from watching Matt, so from watching you. So it’s a — it’s cool because the distortion that I print onto the synth is the stuff that I — you know, that I know you’re going to be able to be like, “Oh, that’s cool, I can do this to it.” You know what I’m saying? I know you can bring another layer to that sound design. So I guess that would be the mixing aspect of the sound design that I would have previously done with the synth, if that makes sense. Matt: It does. I think we had a conversation about five years ago. I don’t know if you remember this conversation, but I was working on one of your records, and you had three kicks that were layered on top of each other. Samik: Right, back when I used to layer 19 kicks on top of each other. Samik: Yeah, we’re getting better this time, we’re doing better. Samik: I do absolutely 100% remember this conversation. This was at the Philadelphia apartment. Samik: We were working on the R Kelly remix. Matt: Then it’s a link to your sound kit. That would be amazing. [laughs] It’ll be there. So I said, “No, you shouldn’t, because if you’re thinking about the record on that technical of a level, you’re not feeling it, and a lot of times when things aren’t perfectly in phase, they feel better. A lot of the times, when things are goofy and not necessarily technically correct, they feel better,” and so the producer should be thinking about that. Any sonic choice you’re making, any EQ choice you’re making, any phase choice you’re making, it should all be just about the feel of the record, and let me deal with the technical stuff of like — you know, because you ain’t got time for that. Samik: Yeah, ain’t nobody got time for that. Matt: Ain’t nobody got time — Well, I’ve got time for that, that’s the point. Samik: It’s pretty good stuff, guys. Matt: I’ve got this kick drum that I recorded yesterday. So it’s this really roomy kick, and what I’m doing as part of the production is I’m modifying the sound of the kick to make it sound deeper, and a little bit more Hip-Hopy, because I know in the arrangement, it’s going to fill out all of the sub and a lot of the low end, and the bass part is probably going to be a brighter, higher bass. So I’m doing some processing that I would normally think of as EQ processing. Yeah, do you have any questions for me? Samik: Um, okay, from the production to mixing aspect, I would say, do you — how do you prefer to get your sessions, I guess. You know, when you get a session from a producer or if you get stems from a producer, how do you want those things to be? Do you want those, like you said, do you just want some of those things committed, that would be cool, but in arrangement wise, what’s your preference to get the record so you can do your job to the best you’ve got? Samik: All the Maserati stuff. Matt: Yeah, like the Maserati thing. And I might not have all of those plugins. So definitely that. In terms of, you know, you don’t want my job to be difficult, you want me to do my job really well. So I narrowed up the Q a little bit and pulled it out a little bit further, and what happened was the “boing” kind of tone, that diminished even further, but because I narrowed up the Q, the rest of the sound was a little fuller, so it basically was the same kick that you has made, but just a little bit less of a “boing” noise, and a little bit fuller of the kick itself. So I — explaining all that, I’m going into that long winded explanation is to give people the understanding of how a good mixer is often times going to interpret a rough. So yeah. So I think that’s probably a good place to wrap. Samik: Okay, so the address for the sample pack is I’m Operablem, but it’s machinemasters.com/product/im-operablem. Matt: We’re just going to give you the link. That’s the easiest way to do it. Alright guys, until next time. Stop stealing my outro. God dammit!